Increasing energy prices have homeowners emptying their wallets to utility companies, prompting San Diego resident Kenneth Hallwachs to flip his solar switch and generate power for a fraction of the cost. For Kenneth Hallwachs, reconstructing his home to conserve energy was a logical and achievable objective, yet the cost of solar was never in reach. Vivint Solar’s power purchase agreement (PPA) enabled Kenneth to install a solar array that required no upfront cost and he began saving money the very next month on his electric bills. “I care about savings and efficiency. I am the original owner of my home and have begun doing things around the house to save money. I have added digital lighting, attic insulation, double pane windows, a high efficiency cooler, and a new roof to my home. All I was missing was solar, and now I have it. Thank you, Vivint Solar!” said Kenneth Hallwachs. Using the Enphase Microinverter System, this residential solar array will generate energy for 20-30% less of the cost than utility energy, saving the homeowner $40 to $50 a month. The 3.6kW rooftop array consists of M215 Enphase microinvert- ers matched with Trina Solar TSM- 245W modules. 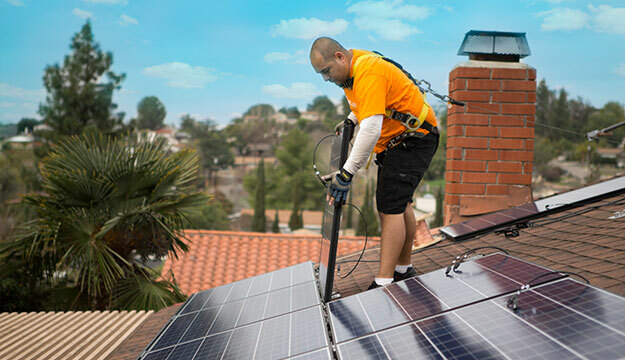 With the ease of connecting Enphase microinverters to the Zep Solar mount- ing hardware, Vivint technicians were able to complete the entire installation in less than a day without any complications. Vivint Solar makes it easy for people to understand the value of solar power by taking customers step-by-step through the contract, targeting their specific energy needs. With Vivint, home- owners are able to track the progress and production of their array through Vivint Solar’s Facebook app. The simplicity of Enphase’s innovative microinverter technology allowed Vivint to fulfill its mission to provide simple, affordable solar technology to this residential home. Vivint professionals can design arrays and make minor adjustments during installation. With a traditional inverter, the shade from a large vent in the middle of the roof could present serious production losses across the entire array. Microinverters minimize this loss of production at an individual panel level, significantly increasing the array’s productivity levels. Being a leading provider of simple, affordable solar solutions as well as an early adopter of the PPA model, Vivint delivers solar systems to customers throughout North America. They provide consumers with the ability to save money, choose their own power source, and protect the environment. At Vivint, we take care of everything. From monitoring and servicing the system, we make sure it’s as easy as possible for the customer.